Acrylic acid and esters are versatile monomers used as building blocks for thousands of polymer formulations. They are flammable, reactive, volatile liquids based on an alpha-, beta-unsaturated carboxyl structure. Incorporation of varying percentages of acrylate monomers permits the production of many formulations for latex and solution copolymers, copolymer plastics and cross-linkable polymer systems. Their performance characteristics—which impart varying degrees of tackiness, durability, hardness, and glass transition temperatures—promote consumption in many end-use applications. Major markets for the esters include surface coatings, textiles, adhesives, and plastics. Polyacrylic acid or copolymers find applications in superabsorbents, detergents, dispersants, flocculants, and thickeners. Superabsorbent polymers (SAPs) are used primarily in disposable diapers. Crude acrylic acid (CAA) is made by the oxidation of propylene. About 55% of the CAA is converted to acrylate esters. The remaining 45% is purified to 98–99.5% purity to glacial acrylic acid (GAA), which, in turn, is converted to polyacrylic acid, which can be further modified to produce superabsorbent polymers (SAPs) and other polyacrylic acid copolymers used as dispersants/antiscalants, anionic polyelectrolytes for water treatment, and rheology modifiers. In 2016, global glacial acrylic acid consumption was estimated to account for about 45% of total crude acrylic acid consumption, of which 79% was consumed for superabsorbent polymers. Growth in GAA consumption is forecast at about 5% per year during 2016‒21. More information on the superabsorbent polymers market can be found in the CEH Superabsorbent Polymers report. Acrylate esters impart many desirable qualities to polymeric materials, such as color stability and clarity, heat and aging resistance, good weatherability, and low-temperature flexibility. One of the important properties of acrylate esters is their glass transition temperature (Tg), which influences the characteristic temperature at which the resultant polymer undergoes a change from a brittle system to a softer, more flexible one. The Tg has a major influence on the minimum film formation temperature of the coating or adhesive. (The minimum film formation temperature is also influenced by the levels and types of cosolvents and coalescing agents, plasticizers, and other additives added to the polymer or to the coating formulation.) The shorter-chain monomers (e.g., methyl acrylate) produce harder, more brittle polymers, while the longer-chain monomers (e.g., 2-ethylhexyl acrylate) impart softness and flexibility. 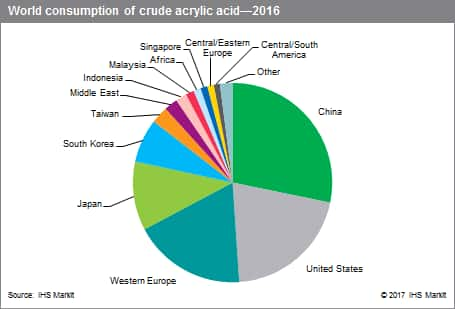 Growth in demand for crude acrylic acid is forecast at 4.5% per year during 2016‒21, driven by growth in superabsorbent polymers at 5.5% and acrylate esters at about 4%. SAP growth will be strongest in China and other areas of Asia, but will be much more moderate in the mature regions of North America, Western Europe, and Japan. SAP is being used in greater quantities as the population in developing nations continues to increase its use of disposable diapers and incontinence products. The SAP growth in Asia is strongly influencing the industry to expand capacity for both crude and glacial acrylic acid, especially in China. Acrylic esters are used principally in coatings and adhesives, which are also areas of growth in developing countries.